If there was one thing proved by Out of the Woods , an interesting Hot Shops group exhibit last summer, it is that wood sculpture can be more than craft or hobby for its artists. Not that there wasn’t fine craftsmanship in this show as seen in the representational design of Herm Rauth’s doorway and coffin. And Robert Dewaele’s highly polished and sensual “driftwood” did border on the familiar and the figurative. Yet aside from this pleasing work, one artist, Robert Miller, eschewed the traditional in form and concept, creating a few pieces that transcended their substance. In other words, “Temple Within,” “Split and Friends” and “Friendship” were sculpture no matter whether made of wood, clay, marble or glass. Miller’s latest examples of quirky, blocky and geometric sculpture are reflected in his current show, Compartments at Gallery 616 in the Old Market. The artist continues his conceptual and largely abstract approach to the medium, and most, though not all of the 12 pieces in Compartments live up to his vision and POV in the exhibit. Compartments makes its case in an articulate artist and show statement that describes the work as emblematic of “the known and unknown spaces in our daily lives. In building an object I am taking away its skin to expose the inner compartments and inner landscapes of our being. This work is about the architecture of space.” Some of these sculptures resemble familiar scale models of towers, domiciles and globes. The visual effect varies from an architectural display, a dollhouse and even a cutaway ant farm. In many of these 3D imaginative cityscapes the emotional impact is a sense of order bordering on or bursting with chaos. Other pieces are more natural or formal in their treatment of wood, but virtually all are layered or filled with wood, paper and metal filings, as well as other found objects, that much resemble the bric-a-brac that clutters our existence physically and mentally. Yet, Miller’s process manages to keep a certain aesthetic detachment, most of the time, which prevents his work from being obvious or self-consciously symbolic. “I cut, sand, polish, scuff, drill, route, mar and oil as the piece develops,” he says, but “there is always the unforeseen that happens and is always welcome.” Also welcome is the sophisticated 616 Gallery, which lends full advantage to Compartments with its own ambiance of low-beamed ceilings, timbered columns and white-washed brick walls. Each of the dozen sculptures enjoys a corner, pedestal or wall treatment of its own. The only improvement would be to give the show’s signature piece, the spherical “Lure (Roll Me),” center stage in the venue allowing for a more 360-degree walk-around view. What viewers will see with this piece as well as most of the others is an understated design and elegance with work that is simple yet complex. The geometric forms are recognizable and reassuring, their inner maze of filled compartments less so. This push/pull sensibility is consistent with Miller’s intent “to show how full and complicated our lives are.” It’s a paradox not even the artist can escape. Put simply, his vision implies that though our endeavors fulfill us, they threaten to entrap or isolate us. Our domiciles — read identities — that we have carved out and invested in risk being ivory towers or caves of discontent built upon our dreams and success as well as fear, prejudices and wretched excess. Miller’s sculptures stand as monuments to either. Ironically, the artist is most successful with his more positive, formal pieces than his chaotic or organic ones. Both extremes require a certain unity and pleasing aesthetic and at times the latter do not. For instance, “House of Waste Not,” a tower of tier after tier of wood, dowel, paint and newspaper collage threatens to tip over with its top-heavy design. It teeters at this very moment. Perhaps this is Miller’s intent, but leave that to the viewer’s imagination. As is, it looks unwieldy and poorly constructed. Also, “Compartment for Time” and “70 Years Ago,” companion pieces of wall sculptures made of plywood and found wood, wire, metal, paper and paint, though more harmonious, flirt with the decorative. The addition of natural branches looks either contrived or an afterthought. Conversely, “Half Moon” is just messy with its abundance of tin and steel shavings that overwhelm an otherwise pleasing design. More effective as an image of a world on the edge of chaos is Miller’s globe, “Lure,” an alluring orb of wood, sheet rock, rubber and found objects that invites viewers to wrap their arms around it as well as their heads. In its multiple, organic layers and pleasing mathematical design, it resembles the dual nature of Bart Vargas’ work, particularly his own sculptural sphere, “Rhombicuboctahedron,” from an earlier show this year at Anderson O’Brien. 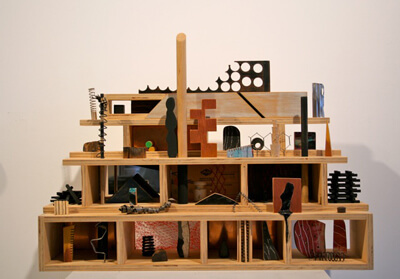 Miller also exhibits a probable unconscious connection to the glass sculpture of Therman Statom with his own two pleasing, compartmentalized dwellings, the towering “High Rise” and its blockier, horizontal version, “Open House.” Each is composed of wood, steel shavings, found objects, netting, metal and paint in an uncluttered setting. They appear to be cross sections of an urban lifestyle or even dollhouses for adults and the only thing missing are the everyman miniatures of Jamie Burmeister, which he calls his “Vermin.” Miller’s most surprising conceptual work here is his abstract wall frieze, “Venice,” composed of wood, found concrete, wire, glass, twine and paint. Aptly titled, this is a very iconic, sophisticated blend of art, artifice and nature that portrays any richly complex civilization past its prime, in the midst of cultural and natural decay. His minimalist composition, subtle textures and craftsmanship in this piece transform wood into marble while avoiding the ornate and decorative. If this marks Miller’s new direction, it’s a welcomed one, free of the compartments normally occupied by those who create with wood. Compartments: New Work by Robert Miller continues through Dec. 30, at Gallery 616, 616 S. 11th St. Call 214.3061.